Bed Bug Bites Itching - How To Stop It? Bed Bug Bites Itching – How To Stop It? Bed bug bites itching is the result of bed bugs feeding on human blood. Bed bugs are very small, similar in size to an apple seed. Bed bug bites itching tends to appear as a series of red, circular patches found in a line or in clusters on the skin. Bed bugs are most often found in places where many different people stay overnight like hotels, homeless shelters, and dormitories. They come out at night in search human blood. Bed bugs feed every 5 or so days. Unlike ticks, bed bugs do not stay on a person. They hide in dark places waiting until it is time for their next meal. 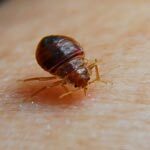 You can easily bring bed bugs home with you in your suitcase or on your clothes. Bed bugs are even found in stores. You can bring them home on new clothes or furniture. If you are not sure whether or not your bites come from bed bugs, consult a medical professional who has experience identifying insect bites. Bed bug bites symptoms include itching, a round and red mark with a darker red in the middle, and appear in a cluster or a rough line. The bites are usually found on the hands, arms, face and neck. One way to treat bed bug bites itching is to apply over the counter cortisone cream to the site. Another helpful bed bug bites treatment is to take an over the counter oral antihistamine like Benadryl. These treatments for bed bug bites are similar to treatment for flea bites on humans. If bed bug bites itching is accompanied by more severe reactions like blisters, hives or severe itching, a medical professional should be consulted. If you find that you have bedbugs in your home, you will probably need to call in a professional exterminator. Bed bugs are notoriously resistant to pesticides.